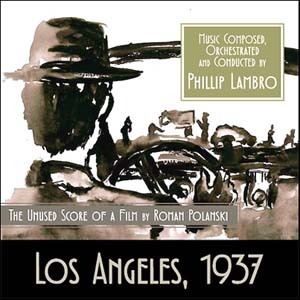 The 252nd Soundtrack of the Week is Los Angeles, 1937 by Phillip Lambro: in other words, Chinatown again, as it originally was. Jerry Goldsmith's score for Chinatown is famous for being a last-minute replacement for rejected score. Now we can hear what it took the place of. The "Main Titles" are quite effective, beginning with eerie percussion and strings and sliding into a sultry, bluesy, '30s jazz thing with some unusual sounds coming from strings and percussion. It conjures up an atmosphere of decadence and decay, which seems like a likely intention. "Tailing Hollis" is a miniature masterpiece of strange percussion noises. "The Boy on a Horse" also exploits the possibilities of percussion instruments, this time against a background of droning strings. Both of these cues are wonderful. Pitched drums and uneasy strings introduce "Noah Cross". The use of wood blocks reminded me of Masaru Sato. "Mariachi Square" is a strangely subdued take on Mexican folk music. The "Orchard Chase" is effectively driving and exciting, with pounding drums and stabbing piano. Vibes and piano introduce the gently swinging, romantic and bluesy "One Night with Evely". Strings come in to create a lush setting for the melody, which is a reprise of the main title music. "Finding the Captive" and "The Last of Ida Sessions" are short, atmospheric pieces that exploit the possibilities of percussion and, like some of the other cues, have some otherworldly, mysterious sounds. The lovely main theme is reprised in "Forget It, Jake". Also on the CD are the bonus tracks of "Trailer Music", "Structures for String Orchestra I and II" and "Music for Wind, Brass and Percusion I and II". The latter two pieces were Lambro compositions that Polanski used to track Chinatown before there was an original score. Lambro's score was used for the movie's preview even after it was removed from the film itself, and so that is included here as well.